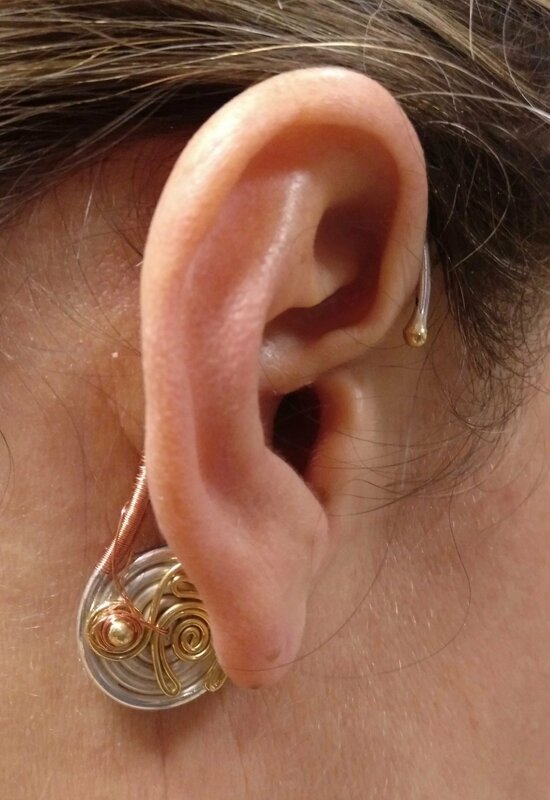 It is made of silver with gold and microcircuitry and its function is to support hearing ability. It can be useful also to mitigate ringing ears. It is made of silver, gold, copper and microcircuitry in alchemical ink. Its function is to support hearing ability. It interacts energetically with the areas of the brain that regulate hearing, supporting an effective exchange of information and therefore supporting their correct functioning. In many instances it has proven useful in mitigating tinnitus. It is advisable to start using this selfica at the very onset of problems, so that it can slow down the process of deterioration. This self is to be used gradually, putting it behind an ear, with the part with the circuit inward, for periods of 20 minutes at a time in different moments during the day. As the ink microcircuitry needs to be in touch with the skin or as close as possible to it, you will need to adjust the selfica, bending the silver part gently as necessary.